Welcome to the worlds greatest guide to Men's Yankee Shirts. Are you actually looking for men's Yankees tops? Well, we hope you are because the reality is that you have found our men's Yankees shirt page. 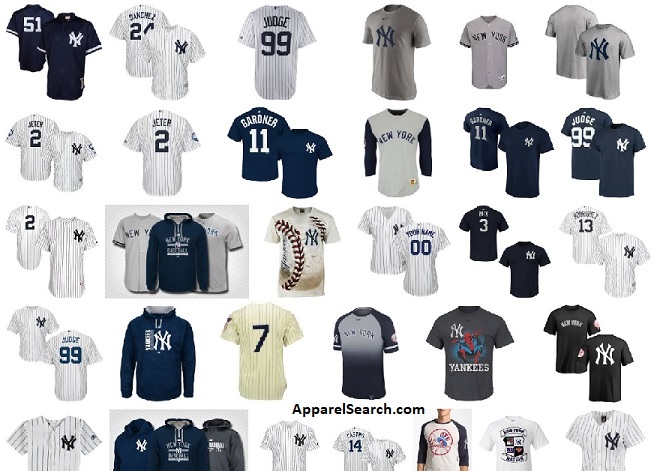 In this area of the Apparel Search directory, you will find all sorts of interesting information regarding New York Yankees shirts for men. The team colors are Navy Blue, White and Gray. The home uniform is white with distinctive pinstripes and a navy blue interlocking "NY" at the chest. The away uniform is gray with a navy blue "NEW YORK" written across the chest. The player number is on the back of the uniform jersey, and is not accompanied by the player name. A navy blue cap with a white interlocking "NY" logo is worn with both uniforms. In 1929, the New York Yankees became the first team to make numbers a permanent part of the uniform. Many companies have created replica Yankee jerseys and other apparel with the player name above the number on the back for fans to purchase, but no official Yankee uniform has ever had a name on the back. The home uniform has been the same (apart from minor changes) since 1936 – longer than any current uniform design in Major League Baseball – although patches commemorating milestones or special events may be worn for all or part of a season. The team will occasionally wear a black armband on the left sleeve, usually in honor of a Yankee great that died (in the case of some players, his number is frequently sewn above the armband). In 1990, the Yankees wore a #1 patch on their left sleeve in tribute to Billy Martin, who died in a car crash on Christmas Day of 1989. It was the first time the Yankees paid tribute to a retired legend by putting their jersey number on their left sleeve. They did the same for Mickey Mantle in 1995, Joe DiMaggio in 1999, Phil Rizzuto in 2007 and Yogi Berra in late 2015. Athletes as well as fans enjoy the honor of wearing a Yankees shirt. Tops with team logos, names, or numbers, come in many varieties. A team jersey as used in sport is a shirt worn by a member of a team, typically depicting the athlete's name and team number as well as the logotype of the team or corporate sponsor. A baseball jersey is usually a button up shirt. Fans have the opportunity to purchase similar shirts. A baseball uniform is a type of uniform worn by baseball players. Most baseball uniforms have the names and uniform numbers of players who wear them, usually on the backs of the uniforms to distinguish players from each other. Baseball shirts (jerseys), pants, shoes, socks, caps, and gloves are parts of baseball uniforms. Most uniforms have different logos and colors to aid players, officials, and spectators in distinguishing the two teams from each other and the officials. Throughout much of their tenure as the Highlanders, the logo was variations of a stylized N and Y, which lay separately on either side of the jersey's breast. In 1905, the two locked for one season, but not in the way used today. It wasn't until 1909 that the team changed to the familiar interlocking NY that would be the team logo long after the team became known as the Yankees, and would continue to be the cap insignia until today. The interlocking NY was originally designed by Tiffany & Co. and struck on a medal of honor presented in 1877 to John McDowell, a NYC police officer shot in the line of duty. The primary logo, created in 1947 by sports artist Henry Alonzo Keller, consists of "Yankees" against a baseball, written in red script with a red bat forming the vertical line of the K, an Uncle Sam hat hanging from the barrel. The logo was slightly changed over the years, with the current version first appearing in the 1970s. The interlocking NY has varied greatly, and there are currently three major versions in use. The first is the cap insignia, in which the N and Y are of about the same size and unadorned. The second is the logo on the breast of the home jersey. This logo first appeared there in 1912, continued through the 1913 renaming to the New York Yankees, and after disappearing in 1917, returned for good in 1936, although there have been many small but apparent changes through the years. In the jersey logo, the Y is larger, the letters more blocky, and the curves more exaggerated. The third is the print logo which is used extensively in marketing, is painted behind home plate at the Stadium, and appears on the team's batting helmets. The N is larger and more curved, and the letters have large serifs at the end. The Yankees use a block letter "NEW YORK" wordmark on the gray road uniform which has also become emblematic. There is also a print version of the full name, which is of a more fanciful script than the name appears in the team logo. Did you know that coaches need to wear team jerseys as well? In contrast to many other team sports, baseball managers and coaches generally wear their team's uniforms; coaches must be in uniform in order to be allowed on the field to confer with players during a game. If you are interested, you are welcome to search for additional men's baseball shirts. Or you can stick with the theme of the Yankees and check out the Men's Yankee Baseball Hats and Men's Yankee Baseball Jacket pages. Apparel Search is a leading guide to fashion, style, clothing, glam and all things relevant to apparel. We hope that you find this Men's Yankee Shirts page to be helpful. What ever team you are wearing over your heart is a good way to show your team spirit. Thank you for taking the time to visit this page of our menswear guide. We hope that you have found it to be helpful.